Southwest Portland neighborhood posts signs inspired by its history of dairies, including the remaining landmark Alpenrose Dairy. When Hayhurst Neighborhood Association President Janet Hawkins tries to orient those less familiar with the conglomeration of Southwest Portland neighborhoods to Hayhurst, she tells them that the neighborhood lies near the western edge of the city and boasts Alpenrose Dairy as a familiar attraction. But until recently, when the average visitor meandered through Hayhurst without the help of Hawkins or other Hayhurst residents, they might not have known exactly where they were because of a lack of neighborhood signs. 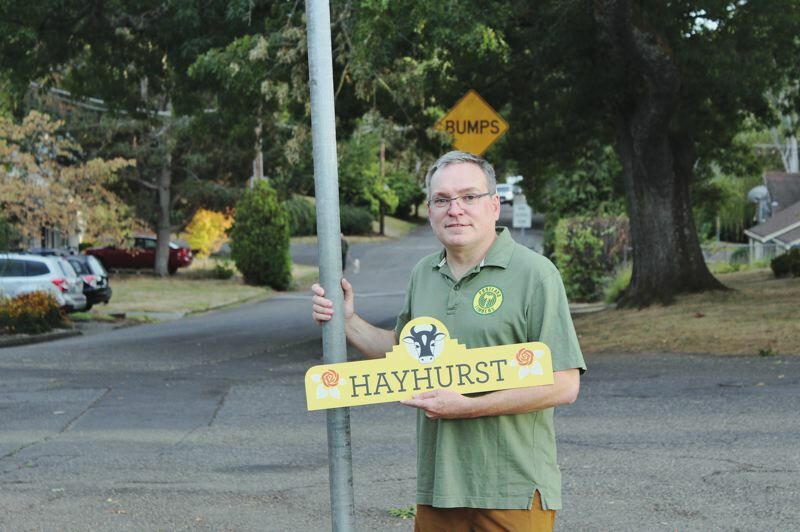 Now, through the Hayhurst sign-topper project — the placement of dozens of signs etched with the neighborhood's namesake placed across the community — the HNA is hoping to strengthen the neighborhood's identity while providing non-residents with helpful reference points. "People want to live somewhere where they feel like it's home and a place I'm proud of and is recognizable," Hayhurst resident and sign-topper project leader Alex Cousins said. "People say, 'You live there? I love going there.' Multnomah Village is a good example." Cousins brought the idea of the sign-topper project to the neighborhood association two years ago. Immediately, he said, residents were on board. So the design work began. From the moment the project started, he believed a cow should be placed at the top of the sign because of the myriad dairies that used to be present in the neighborhood and the current prominence of Alpenrose, which sponsors the HNA's National Night Out. He also appreciated neighborhood signs that represent neighborhood character — such as the water tower emblem placed in The Pearl and the Goose emblem in Goose Hollow. "Hayhurst, over 100 years ago when this area was being settled, was raw land and that became dairy farms. It was kind of a journey to get into Portland from out here. There weren't road systems," he said. "Over the years, those dairies went away by and large, and Alpenrose is the last one standing. It's a big community asset for not just Southwest Portland but the whole community. "People are really happy they're (Alpenrose Dairy) here," he said. "They do a lot to give back to the neighborhood." Cousins paid a graphic design artist who had created the Alameda neighborhood signs to produce a couple dozen design options for Hayhurst. When he brought the designs to neighborhood association meetings, residents especially liked the yellow design with a cow emblem at the top and roses on the sides. Due to widespread support, the HNA chose that design. "I just resonate with the color," Hawkins said. "I'm a Duck. I like the brightness and the contrast. It really pops." Cost, though, would be a key factor. While Cousins said producing the signs costs about $20 apiece, paying for the Portland Bureau of Transportation to install them brought the cost to about $100 apiece. The HNA relied on private donations, including a $2,100 donation from Alpenrose Dairy, to fund the project. "We knew that Alpenrose would probably be a good place to ask for a donation for the campaign," Cousins said. "They've been 100 percent supportive and super helpful." In late August, Cousins witnessed the installation of the first sign. The first phase of the project includes 47 signs, and the second phase could include many more. Cousins lauded resident Leslie Hammond's work to raise funds for the project and Dylan Lazon's diligent strolls around the neighborhood to determine which areas needed signs. "(It was) awesome," Cousins said. "It was really exciting to see (the first sign) go up. Somebody put up a post on Nextdoor showing the workers putting it up on Beaverton Hillsdale Highway and she put: 'This is Happening.' And there were all these comments on it." Cousins said Hayhurst residents appreciate the rolling hills, the large setbacks, older housing stock and the history of dairies in the community. Through the project, he hopes others will notice the community's assets as well. "It seemed like a good opportunity to make our neighborhood a bit more visible," Cousins said. "And the dairy theme seemed to fit very well. Who doesn't like cows?"